Very dirty, very wet. – Dirty wet dog , boats and sailing. 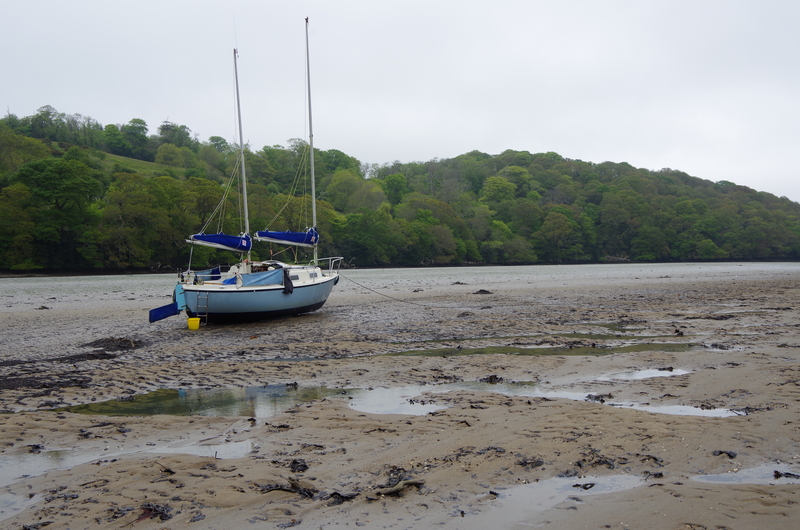 The quintessential boatyard job is i believe the act of getting underneath a dirty boat on a muddy slipway on a dank and wet day to wet sand and antifoul the hull. Chris and Julia at the yard very kindly put WABI”’ in the slings while i was at work and allowed me the use of the hoist over the weekend so that i could get all my jobs done and the only proviso being that it had to go back in the water on monday morning ready or no. The engine was already off and being serviced (carp in the carb) so i could focus on the underneath and the rudder. The underside is simply a matter of a scrub and a wet rub down, mask and antifoul so as of day 1 of my work weekend most of the hull is done : tomorrow i just need to put her on blocks and finish the strips under the hoist slings. I would really like to have buffed and polished the hull as the GRP is a bit chalky : apparently this colour GRP is prone to that and needs a polish-out occasionally, sadly i just don’t have the tools or the time just yet.